Berenice Abbott’s (b. 1898) series, Changing New York, on display at Bookstein Projects, captures the impact of the Great Depression on the city’s urban landscape. The body of work was compiled between 1935 and 1939, and offers a visually arresting insight into the era. Through a bold use of light and form, Abbott’s images reflect New York’s shifting cultural and structural topographies. The photographs represent a community in flux, combining social documentary with aesthetic sensibility. Until 27 July. Find out more at www.booksteinprojects.com. 1. Berenice Abbott, Fifth Avenue Houses #4, 6 and 8 (from the series “Changing New York“), 1936. 2. 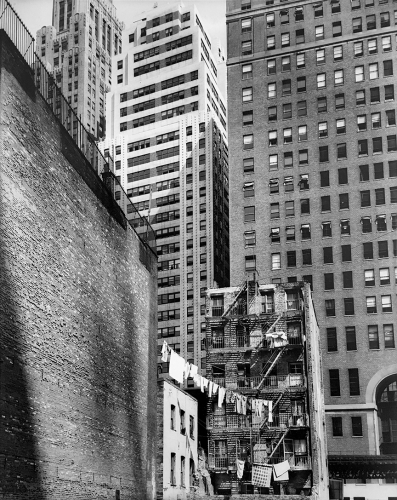 Berenice Abbott, Construction Old and New (from the series “Changing New York“), 1936. 3. Berenice Abbott, Willow and Poplar Streets (from the series “Changing New York“), 1936. Aesthetica, “A Shifting Topography,” July 20, 2018. www.aestheticamagazine.com/a-shifting-topography/ .